Now more than ever, in the gear-obsessed landscape of photography, importance is often placed first and foremost on equipment. There is an incredible amount of content available to photographers online, telling you both exactly what you need to buy and how exactly you should be using it, in order to become an expert photographer. Binging YouTube tutorials, diving deep into your camera manual, and seeking out the latest and greatest gadgets to assist in the pursuit of your dream shots - these can all be super productive activities, but don’t let them distract from other aspects of improving your craft. While gear certainly plays a critical role in capturing successful wildlife photographs, in my humble opinion, it’s infinitely less important than developing a deep understanding of your subjects and their relationships with the environments in which they live. 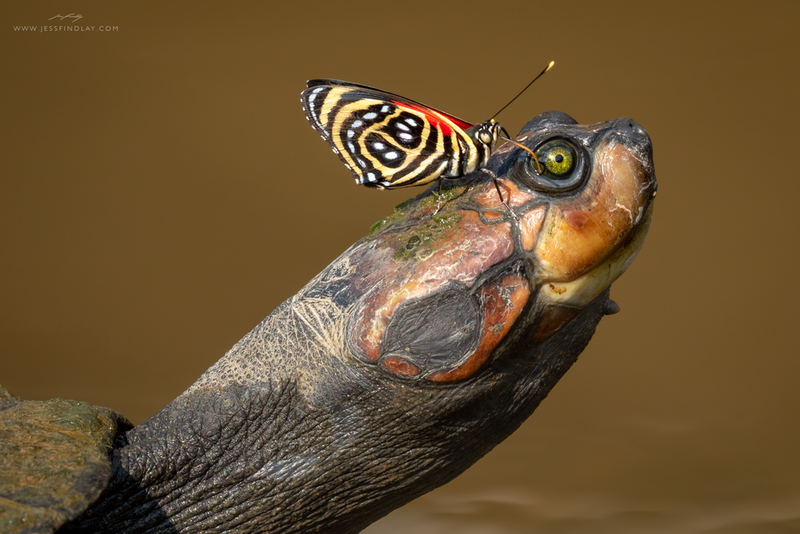 This post is meant to encourage a different, more immersive approach to progressing as a photographer, through finding, observing and eventually photographing wildlife. Keep in mind that many of the suggestions you’ll find mentioned below are not necessarily the sort of skills you can fully learn online or in a book, they need to be put into practice in the field and honed over time. Though not entirely limited to, this applies mainly to mammals - creatures that often present entirely different challenges to those you may encounter with birds and other wildlife. Many are far more active at night, especially during warmer summer months. Only certain species, during specific times of year, present any sort of auditory clues (i.e. Elk bugling during the rut). Additionally, due to hunting pressures and general predatory response, many species can be very wary of humans. Here in the mountains of British Columbia for example, it isn’t uncommon for me to go out snowshoeing for a day without physically seeing a single animal, but uncover the evidence of 8 or 10 different species of mammals. A basic understanding of tracking and a strong sense of curiosity will not only greatly enhance your time in the outdoors, it can also become an indispensable tool for finding and photographing a given species. An assortment of books and video tutorials are widely available on this very nuanced subject. However, I’ve found the best way to learn is to simply get outdoors and train your eyes - especially if you can link up with an experienced tracker. You’ll be surprised at how much you can discover, even in snow-free landscapes. During winter, head out the morning after a fresh snowfall when visible tracks will have been laid down more recently. During summer months or in snow-free landscapes, look for “track traps” such as soft, sandy soil, or the muddy margins of ponds, puddles, creeks or any other water course. Be on the lookout for natural bottlenecks in the landscape that may funnel wildlife. Log crossings, gullies, etc. Keep an eye out for the food source of your species of focus. Are there any recent signs of active feeding? Snowshoe Hare tracks after a dusting of fresh snow in the Cascade Mountains of British Columbia. Alder shrubs browsed by a Snowshoe Hare, showing the characteristic 45 degree bite marks. A super fresh Coastal Wolf track on a Vancouver Island beach. Polar Bear track at the northernmost tip of Alaska. Want to find birds to photograph? Become an expert birdwatcher. Makes sense, no? For many, the transition into more serious bird photography comes as a natural progression from birdwatching and documenting one’s findings. This bit of advice however, is particularly important for those who’ve found their way into this facet of nature photography via a different route, who perhaps may not have the same level of experience with birds or the outdoors in general. To overcome these challenges, it’s very important to do your homework. If you head out into the field, not knowing exactly what to look/listen for, it’s easy to come away with an empty memory card, or at the very least, a card full of images you aren’t truly proud of. Become very familiar with your local birds, and not just the showy males either. Acquaint yourself with the plumage of the females and juvenile birds too. Of equal or perhaps even greater importance is developing knowledge of calls and songs. In many cases, a successful photography attempt can be attributed to hearing the bird long before it actually becomes visible. Keen ears can make all the difference! Go birding!!! When the light isn’t quite right, or you just simply want to head outdoors sans camera, take a walk with your binoculars in your local forest, wetland, prairie - whatever you have nearby. Move slowly and listen carefully. Download a birding app (many are free) for your smart phone or tablet. If there are any particular birds you’re most interested in, commit their calls and songs to your memory. Read up on your target species’ life history, including their distribution, habitat requirements, food preferences, breeding behaviour, etc. When you spot a bird, try to distinguish what about the area has attracted it. Is there a food source nearby? Is it suitable nesting habitat? Give yourself targets and plan your trips/outings with those specific birds in mind. Focus your efforts. Without recognizing the soft calls of this American Kestrel as he communicated with his mate inside, I never would have found this photogenic nest cavity, otherwise hidden from view where I was walking. Hearing the begging calls of two Great Grey Owl nestlings from several hundred metres away led me to a beautiful site, resulting in several days of photography opportunities. 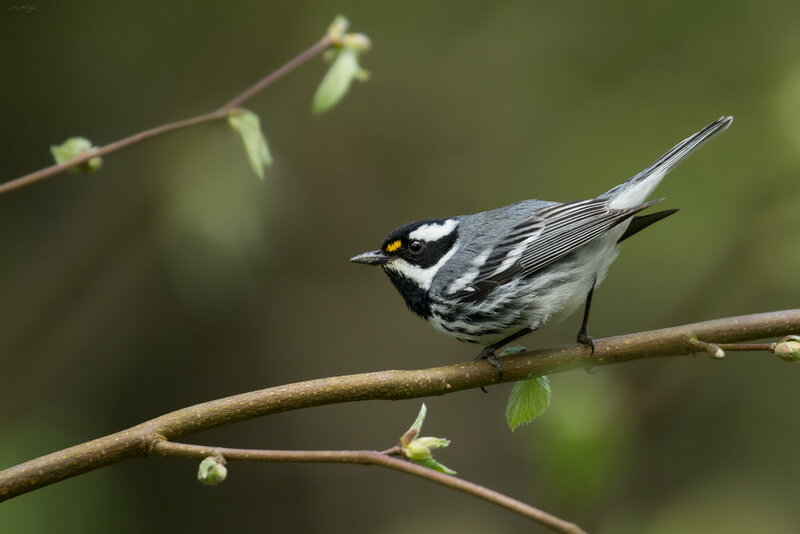 An understanding of the migratory timing of this Black-throated Grey Warbler ensured I was there within one or two days of his arrival. Birds tend to be more active in defending their territories and advertising to potential mates during a fairly brief window, early in the breeding season. The canopy of bigleaf maples had yet to close in, allowing for lots of light, and the fresh buds on this beaked hazelnut made for a photogenic perch. The ability to key in on the habitat preferences of your target species is a big asset when it comes to tracking down wildlife. Typically, this has a lot to do with food requirements, nesting opportunities, safety and an assortment of other factors. As the cornerstone of most environments found in nature, a deeper understanding of the various plants and trees of a given area helps paint a broader picture of the general ecology. This in turn will undoubtedly give you a leg up in your search for wildlife. Finding the specific forest composition preferred by Snowshoe Hare (the winter diet staple of the Canada Lynx) was an essential step in experiencing this close encounter. A large patch of blooming salmonberry shrubs led me to this territorial male Rufous Hummingbird. Trembling aspens are very susceptible to a fungal disease known as “heartrot”. The infected trees are particularly suitable for nesting woodpeckers who bore cavities in the trunks in which they raise their young. 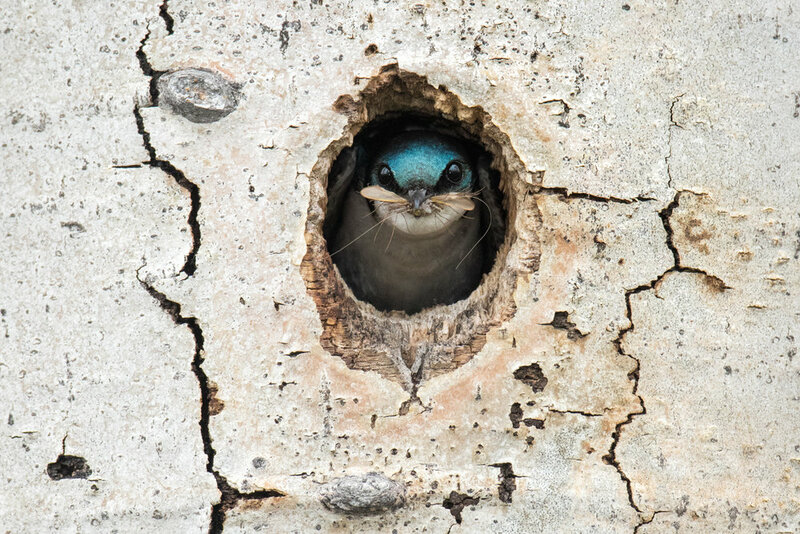 Secondary cavity nesters such as bluebirds and swallows reuse these cavities during subsequent years. After coming across a beautiful copse of aspens within close proximity to a marsh (marsh = plenty of flying insects, which swallows prey upon), I set off to see if Tree Swallows were indeed nesting here. Three active cavities were found within 100m². By scanning a steep mountainside, high in the Ecuadorian Andes, I located a patch of freshly eaten Puya bromeliads. These are the preferred food of the Spectacled Bear. Drying out in the strong equatorial sun, the remnants left behind by a hungry bear darken with age. Bright white shards of vegetation confirmed we had just missed one. A couple days of hiking later, I located this beautiful animal on an adjacent slope. Invest in a field guide to bring with you on walks and photography adventures. For those here in British Columbia, I prefer the Pojar | MacKinnon books. Study up on what might be feeding on the vegetation, fruits and seeds of the native plants growing in your area. Consider the bigger picture of how plants form communities which affect how wildlife utilize the landscape. One of the aspects of my wildlife photography process that I’ve come to realize the tremendous importance of is dedicating time solely to scouting. There will be times when spending hours or even days away from your equipment may seem counterproductive - and yes - you may miss the odd incidental shot, but in my experience, the investment in time and effort will lead you to the true gems. I’ve also found this wandering, free from the expectation of coming away with an amazing picture, to be very cathartic. You can simply be present, using your senses to uncover what opportunities are out there. In addition to being a fantastic citizen science initiative, eBird.org is a great resource for birders and photographers to discover the sightings of others, either to follow up on, or use as a reference to gauge proper habitat and migratory timing. SunCalc is a very practical website/app that I use to determine the angle of light and how it correlates with my intended shooting location. This helps me decide when the ideal time of day will be to visit a given site. Google Earth is a great tool for examining habitat and prospecting the best possible routes when accessing backcountry areas. Having found a tall rocky outcropping surrounded by conifers while hiking during the winter, I made a note to return the following May. 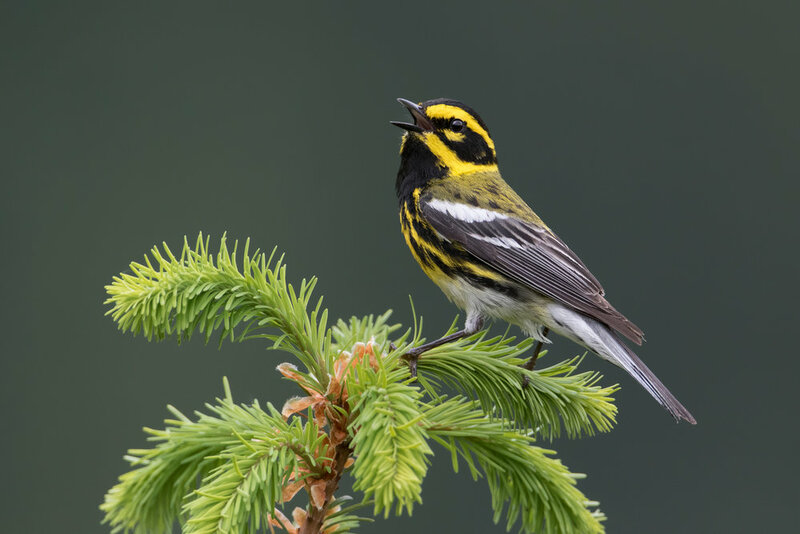 My hope was that the cliffs would allow for eye-level views of Townsend's Warbler: one of the most beautiful birds found here in the Pacific Northwest, who spend the majority of their time high in the canopy. Upon returning to the site during the breeding season, several males were staking their claim on territories.